Featuring Batman and Superman as headliners, fists fly and heroes come to blow in the latest animated feature from the DC Universe Animated Original Movie line. Based on the initial six-issue “Public Enemies” arc from the Superman/Batman comic series, Superman and Batman go toe to toe with a plethora of friends and foes in an attempt to stop yet another evil plot courtesy of Lex Luthor. And, yes, while this movie is just filled to the brim with overblown action sequences and fight scenes, it also doesn’t try to be anything else but a big “smash-em-up” with an assortment of different DC characters from beginning to end. As much as that may be a hinderance for the movie, it’s also the biggest selling point for Superman/Batman: Public Enemies as well. 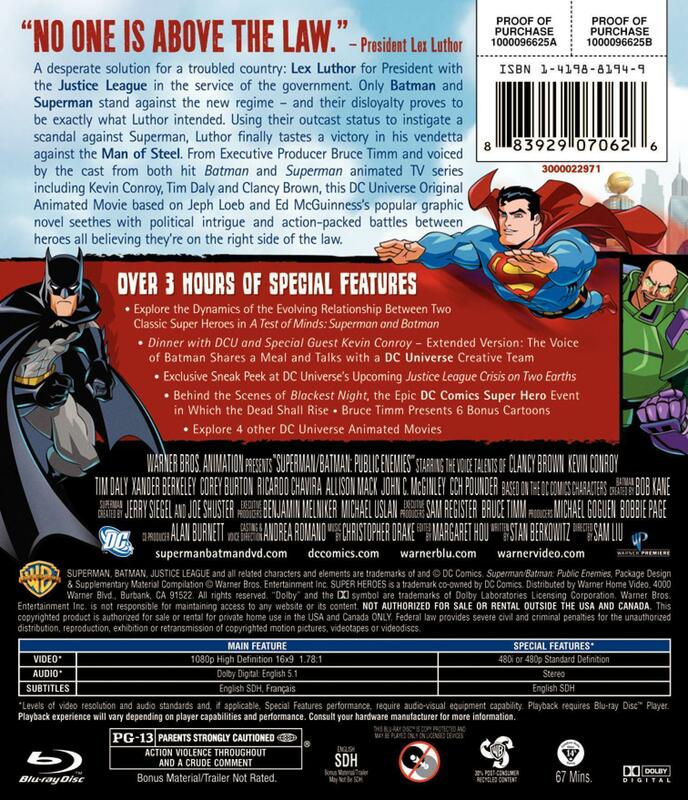 Along the line of Warner Home Video’s previous releases in the DC Universe Animated Original Movie line, we pretty much get the same treatment here for Superman/Batman: Public Enemies. The Blu-ray release features the standard Elite case with a reflective foil/embossed slipcover, a single disc inside and an insert for WB Insider Rewards and the Digital Copy redemption code. Pretty basic and all handled well. Looking inside, let’s start with the audio and video transfers. As usual, Warner Home Video really hits it out of the park with the video again, but also surprisingly stumbles on the audio. Superman/Batman: Public Enemies features some nice animation and the stellar transfer allows it all to come shining through in all its glory. The 1080p/VC-1 encoded transfer is to die for here, and I can’t find a single fault with the transfer. No compression, artifacting, anything. Warner Home Video definitely deserve praise for their work on the transfer, as compression, pixelation, color banding, etc., is nowhere to be seen during the entire feature. That being said, I did find the audio transfer to be disappointing, mainly because there’s no TrueHD 5.1 audio track, just a simple Dolby Digital 5.1 mix. The dialogue is crystal clear and easy to make out, but more of the bigger moments lack punch. Explosions, battles, and the like seem to lack significant power. It’s just bizarre that Warner Home Video would manage to pull of such a great looking video transfer here, but just end up tossing on a disappointing audio track. If only a single audio track is going to be included, why not the TrueHD track over the Dolby Digital? It doesn’t make sense to me, and it’s a little disappointing. The audio track is good, don’t get me wrong, but there’s no doubt the TrueHD track would have been much better. Moving on to the extras, Warner Home Video again includes a mixed bag of content, bringing in both new and old material. While there is over three hours of bonus material, as stated on the packaging, a good chunk of it is carried over from previous releases in the form of bonus episodes and repeated featurettes. The bonus material breaks down to “A Test of Minds: Superman and Batman” featurette, “Dinner with DCU and Special Guest Kevin Conroy, ” “A First Look at Justice League: A Crisis on Two Earths,” “Blackest Night: Inside the DC Comics Event,” “”First Look” at previous DC Universe titles,” and six “Bruce Timm Presents” bonus episodes, all presented in standard definition. Going through the list, “A Test of Minds: The Psychology of Batman and Superman” is an interesting look at how these two famed super hero characters tick. Looking at both the why and how, a handful of authors dissect the relationship, both apart and together, of the World’s Finest super-hero team. An interesting look at Batman and Superman, admittedly. “Dinner with DCU and Special Guest Kevin Conroy” is next on the list and, well, the title should say it all, really. Clocking in at nearly an hour, this lengthy bonus feature joins Kevin Conroy, Bruce Timm, Andrea Romano, and Gregory Noveck as they, well, sit around a dinner table and just chat away. And as vanilla as that may sound to some people, it’s the complete opposite here. I would label this as required viewing for any fan of DC Animation, specifically the “extended” version here on Blu-ray. Not just Superman/Batman: Public Enemies is talked about, but Batman: The Animated Series, the DCAU, and even the work of other key voice actors to DC Animation and the Batman mythos. It’s great, fascinating stuff with some stories repeated from previous interviews, true, but this still remains just key viewing. Stories are just lobbed out left and right and it’s an absolutely riveting listen, easily the highlight of the bonus features. Moving on, “A First Look at Justice League: A Crisis on Two Earths” provides a close look at the next DC Universe Animated Original Movie title. A reworked version of Dwayne McDuffie’s famed Justice League: Worlds Collide script, the Justice League faces off against villainous counterparts from another universe in what looks to be another superbly designed feature. With McDuffie on script and direction by Lauren Montgomery and Sam Liu, this looks like it could be the best title in this still young direct-to-video line to date. It looks great, the voice cast is impressive, and the pedigree behind it is staggering. Let’s all hope for the best come Spring 2010. 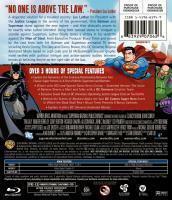 Other promotional features for some of the previous DC Universe Animated Original Movie titles, as well as the current Blackest Night comic crossover event, are also included here. 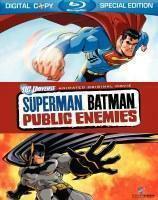 Six episodes are included on the Superman/Batman: Public Enemies Blu-ray release, including the Justice League Unlimited episodes “Question Authority,” “Flashpoint,” “Panic in the Sky,” and “Divided We Fall” and Superman: The Animated Series episodes “Knight Time” and “The Demon Reborn.” Fans will be happy to note that the Justice League Unlimited episode “Divided We Fall” included here appears without a single audio or video glitch. To briefly explain, when the same episode was included in the Justice League Unlimited: Season One DVD collection, there was a very noticeable glitch in the audio transfer of the episode, resulting in a few seconds of audio skipping ahead and repeating itself during a dramatic action sequence. Here, said glitch is nowhere to be seen (or “heard,” I suppose). So, for fans looking to finally have a perfect standard definition copy of this episode, it’s included here. And, thankfully, the five other episodes includes also look pretty sharp, despite being featured in just standard definition. As an overall package, Superman/Batman: Public Enemies is a really solid release on all accounts. The main feature is definitely worth checking out and the bonus features hold just as much clout for the fans. While A good portion of the bonus materials is repeated content, in terms of bonus episodes and preview trailers, the original bonus content is surprisingly in-depth and a joy to watch, especially for fans of Batman: The Animated Series thanks to the amazing “Dinner with DCU and Special Guest Kevin Conroy” extra, which makes up for the lack of an audio commentary. Warner Home Video has really made a solid Blu-ray release that easily surpasses both DVD releases of Superman/Batman: Public Enemies currently available. 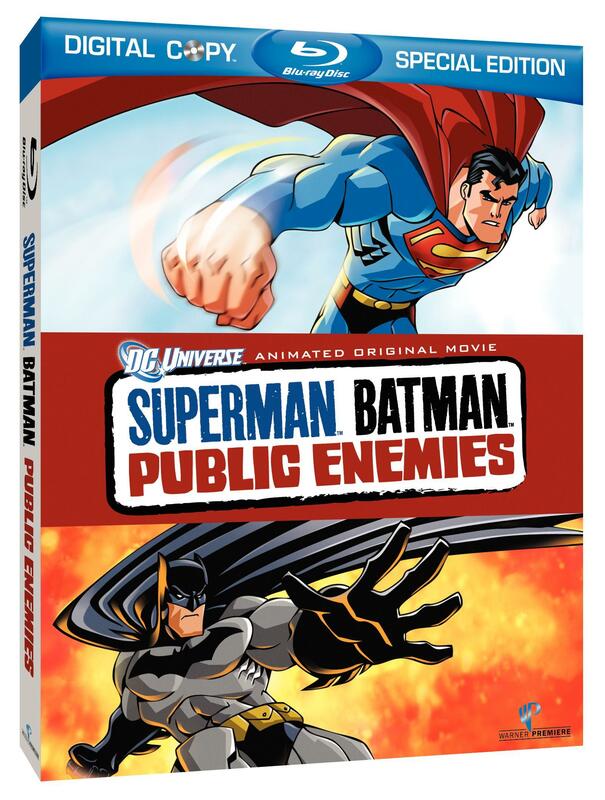 With the better image and audio quality, and more bonus features, the Blu-ray release for Superman/Batman: Public Enemies is definitely Recommended to pick up, and easily surpasses the DVD release for this new direct-to-video animated feature.